Welcome to my pictured reference guide to drumsticks of the members and former members of . All of these sticks are in my collection except where noted. Descriptions in this color green are ones I do not have. I'm interested in obtaining drumsticks I do not have. Feel free to contact me if you have some you think I might need! I've assigned a numbering scheme to be able to differentiate between the drumsticks, especially when multiple variations arise within the same tour. I do not play drums, nor do I claim to be the all knowing authoritarian on drumsticks, so any and all information, corrections, etc. gladly accepted! PC1 - Cappella 5B - light metallic blue on plain wood - "PETER CRISS PERSONAL [over] MODEL"
Note: This pair comes from a showcase performance for some record executives at the Brewery Art Colony (former Pabst Blue Ribbon factory) in Los Angeles for his new band, Balls of Fire. Note: Peter would sell pairs of these sticks at fan-based expos and at the concessions stands during the Bad Boys tour. Note: Prototypes made to try and gain Peter's endorsement. Made after Peter's hand surgery when he realized he needed a thinner stick. PC9 - Ahead 2B black metal sticks with white autograph, Peter's drum tattoo & logo. Black metal handles made of aircraft aluminum, black nylon neck covers and white Zytel nylon tips. Originally made to the size of his KISS Reunion & Psycho Circus sticks, but ultimately he opted for a thinner 5B model. These were sold for a very limited time via special order through drum stores. Note: From 2000-2001, the same FAR-PC1 and FAR-PC2 sticks used by Peter were sold through retail stores. 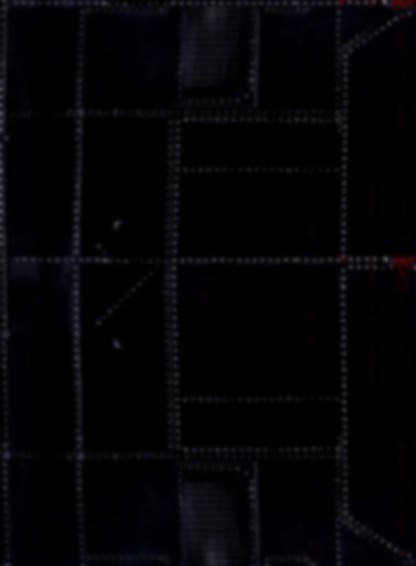 The size markings were not added until 2002. PC10 - Ahead 5B black metal sticks with white autograph, drum tattoo & logo. Black metal handles made of aircraft aluminum, black polyurethane neck covers and white Zytel nylon tips. Similar to his Farewell FAR-PC2, except the stick size "16.375 LT" appears on the handle. .595" diameter, .035" wall, long taper, 16.375" long. These were sold retail through drum stores. PC11 - Ahead 5B black metal sticks with white autograph, drum tattoo & logo. Black metal handles made of aircraft aluminum, black polyurethane neck covers and white Zytel nylon tips. Similar to his Farewell FAR-PC1, except the stick size "16.00 MT " appears on the handle. .595" diameter, .030" wall, long taper, 16" long. These were sold retail through drum stores. PC12 - Ahead 5B black metal sticks with silver autograph, drum tattoo & logo. Black metal handles made of aircraft aluminum, black polyurethane neck covers and white Zytel nylon tips. Similar to his Farewell FAR-PC2, except the stick size "16.375 LT" appears on the handle. .595" diameter, .035" wall, long taper, 16.375" long. This rarer silver print version was sold retail through drum stores in 2005 before Peter's contract ended with Big Bang Distribution. PC13 - Ahead 5B black metal sticks with silver autograph, drum tattoo & logo. Black metal handles made of aircraft aluminum, black polyurethane neck covers and white Zytel nylon tips. Similar to his Farewell FAR-PC1, except the stick size "16.00 MT" appears on the handle. .595" diameter, .030" wall, long taper, 16" long. This rarer silver print version was sold retail through drum stores in 2005 before Peter's contract ended with Big Bang Distribution. Note: Initial prototypes when Peter first re-signed with ProMark. Note: Peter personally hand drew the artwork for these sticks. Only available at his Chiller Theatre Convention appearance 10/27/06-10/29/06 in Secaucus, NJ. PC176 - Pro-Mark TX3RW ROCK model - 16.0531" diameter - red on natural stick with lacquer finish - cross & sig. PC18 - Pro-Mark TXR3JW JAZZ model - 16.125" .0531 diameter - black on natural stick - jazz cat & sig. Note: the purple print was an error, but some of the sticks had been released to distributors already before the error was caught. Early test pressings developed by Calato for Eric Carr's new endorsement. Ultimately, a decision would be made to silkscreen the artwork versus the metal stamp. And the silver on white color scheme would not be used on tour until 1987. Thank you to the Carr family for sharing this wonderful bit of tory. Note: This stick was obtained from Eric during the video shoot for Crazy Nights. It was a prototype and was not used in concert. Note: These sticks were originally made to promote his "All Access to Drumming" video. He did NOT play with these in concert as a member of . In 2001, when he rejoined , he had another batch of ES3 made to sell at fan expos. He did use these for the Lane Bryant fashion show on February 5, 2002. Note: Once he left in 1997, he had the logo removed. He occasionally plays these sticks during drum clinics to promote his "All Access to Drumming" video. 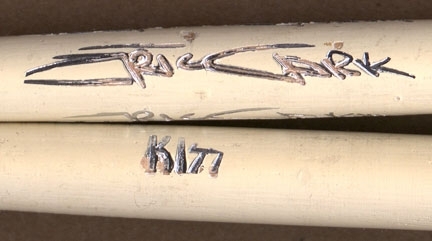 Note: These are Eric's sticks, which he used on several Alice Cooper tours and with many notable other projects such as Glamnation, Gilby Clark and Brian May. He also used this type for the XIX Winter Olympics appearance on February 24, 2002. Note: These were sold at the merchandising booths during the Rock The Nation concerts, but were not actually played during the shows by Eric. Note: These were mostly sold at expo appearances, but Eric may have played with these during a few Alice Cooper shows? Note: These were both sold at expo appearances and played live on the Alice Cooper tour, although I do not know how many of the shows.. Note: These say "Select Hickory" instead of "Selected Hickory"
Note: Starting this year, the Zildjian logo now says "Select Hickory USA". Note: These were sold at the merchandising booths during the Alice Cooper tour, but were not actually played during the shows by Eric. Note: These were sold at the merchandising booths during the Alive 35 concerts starting with the USA dates, but were not actually played during the shows by Eric. Note: These were sold at the merchandising booths during the 2010 Sonic Boom and HSOE concerts, but were not actually played during the shows by Eric. Note: These were sold at the merchandising booths during the 2011 HSOE concerts starting with the USA dates, but were not actually played during the shows by Eric. Note: In addition to be sold in music stores, Eric also played these live, especially in 2013. Note: These were sold at the merchandising booths during the 2013 Monster concerts, but were not actually played during the shows by Eric. Note: New Zildjian USA logo starting this year. No more "Artist Series" or "Select Hickory". Please contact me if you have any extras for sale or trade that I do not have! Any copying, reproduction or use of these texts or images without the express written consent of Ken Rodenas is strictly prohibited. This unofficial, fan based, non-profit site is not associated with KISS Corp. or Live Nation in any way.